Fingerponds are earthen ponds dug at the edge of natural wetlands and stocked naturally with wild fish during flooding. They preserve the wetland environment in which they are situated while maintaining a productive culture system. 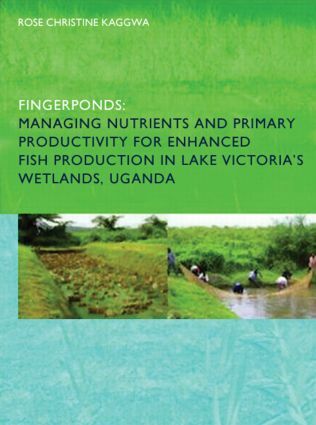 In this study, the importance of organic manure applications in enhancing nutrient levels, phytoplankton and periphyton productivities and ultimately fish production was examined in experimental Fingerponds set up with the participation of local communities in Uganda. Results show that organic manures enhance algal development and fish production in Fingerponds, but close monitoring and control are needed. Fish yields in Fingerponds can be enhanced to 1500 - 2800 kg/ha over a functional period of 200 to 300 days using animal manure (e.g. chicken), fermented green manure and artificial substrates for periphyton development. Good management practices are required to regulate pond inputs and conditions. High clay turbidity, nitrogen limitation and high recruitment of fish can limit fish production. Overall, Fingerponds were shown to be an effective addition to protein production for poor riparian communities in East Africa and are recommended for adoption.